Samuel Johnson included in his Lives of the Poets a "Life of Jonathan Swift." 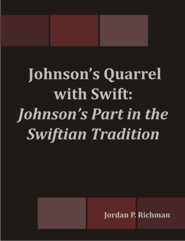 His friends, including his biographer, believed he had formed a prejudice against Swift's life and works. They were relieved to find that Johnson's biography of Swift was fair and judicious, indeed. This dissertation shows the parallels, as well as divergences, between the two writers in satire, political thought, and theological philosophy. Dr. Jordan Richman taught 18th century literature at several universities then retired to form his own successful freelance writing business. He has contributed many articles to various journals and reference works on a number of different subjects. Dr. Richman has also acted as a consultant and editor for authors and publishers. He currently publishes 8 different blogs ranging in subject from writing to music to computer science.